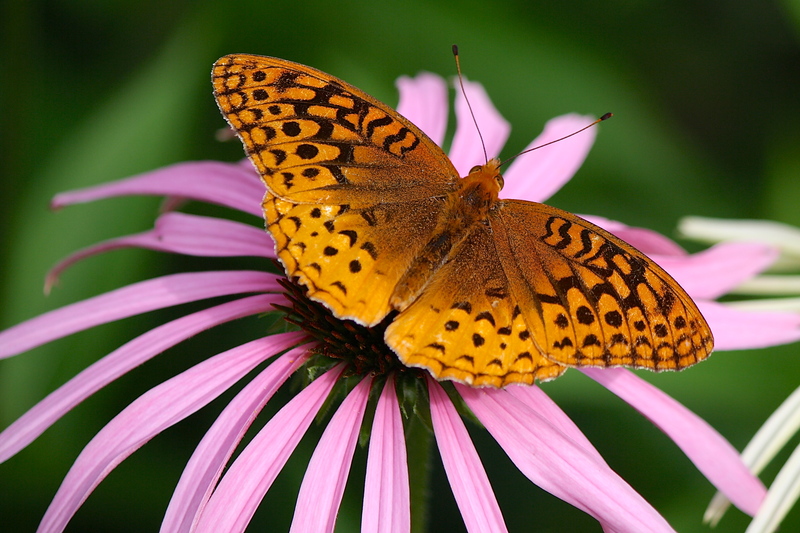 This entry was posted in Field Notes, My Photos and tagged bug, butterfly, coneflower, echinacea purpurea, Great Spangled Fritillary, Insect, lepidoptera, native pollinator, nature photography, Speyeria cybele, Wordless Wednesday. Bookmark the permalink. Wow, Eliza! What a great shot!!! I love fritillaries. Really really wonderful capture. Oh my! The contrast in color and the beauty of each element make for true artistry. Lovely Eliza. Just lovely. Wow, thanks so much Victor! Thanks – I know orange and pink is kind of shocking together, but I like it, esp. when the orange is a butterfly! I was thinking how nicely they set each other off, along with the green. What a beautiful capture Eliza! Beautiful subject matter, too. Thank you very much for the compliment and the visit. Hope you visit again!